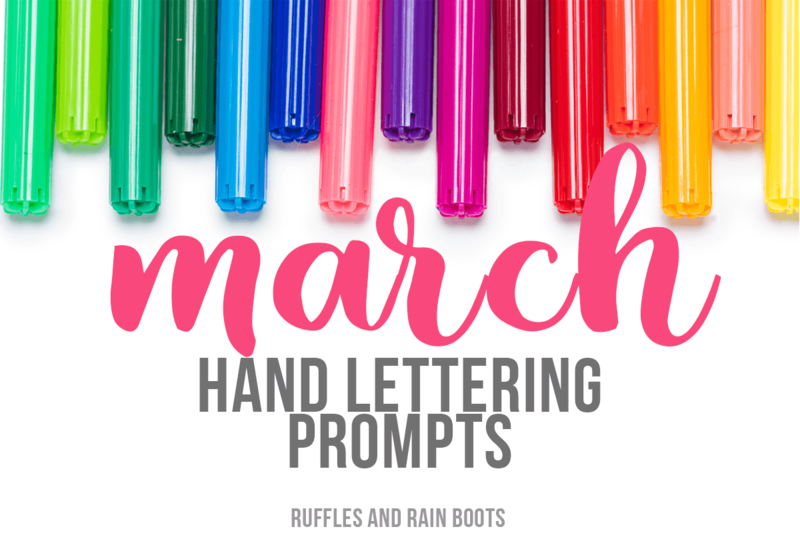 Here is the list of fun and festive March hand lettering prompts for brush lettering practice, March crafts, doodles, or even bullet journal layouts for March. 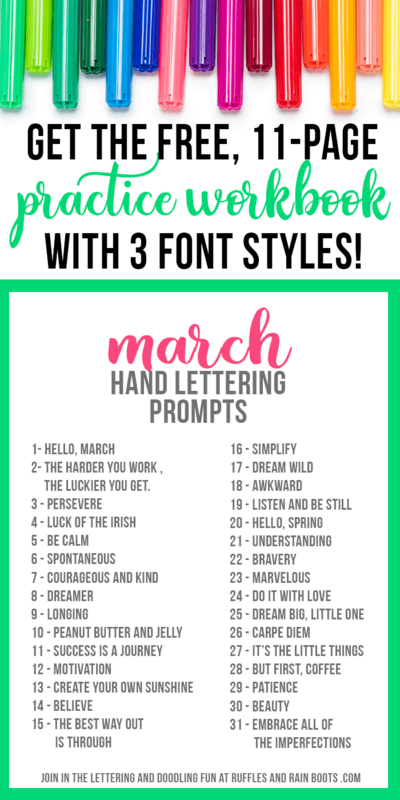 I’ve included three fonts styles in this month’s free hand lettering practice workbook. 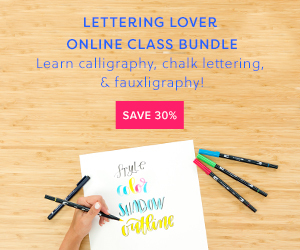 Get started hand lettering today! My daughter recently brought home a poem from school about March and we spent our morning making up a song for it. Pots and pans, wooden spoons, and whisks are still our instruments of choice. This mama just cannot handle the kazoo, y’all. No. This time of year, most parts of the world get a fresh shower to clear away the muck of the winter. Isn’t it so refreshing? Here in Seattle, we just endure a bit more rain. For me, many doodles will accompany the March hand lettering prompts. I’ll throw in flowers, umbrellas, a few baby animals, and a lot of umbrellas and rain showers. What about you? If you keep a bullet journal or a daily diary, do you doodle? Or, do you like to keep it clean and sleek? As always, I’ve included the fonts below and in the practice workbook. 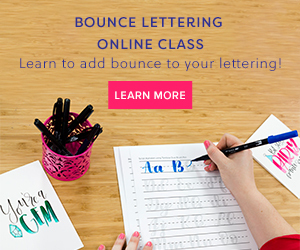 There’s the most adorable bounce font style for you to practice this month. It’s one of my absolute favorites! If you are subscribed to our newsletter, you already have the password (it’s at the bottom of every email I send). Grab that password and get the March Workbook here. 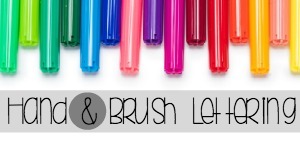 Do you have an idea for a hand lettering March craft already? Practice each letter and start combining them (that last font just screams Spring). If you’re comfortable with it, use a pencil to sketch out the writing. If you’re not yet strong with your favorite but still need to craft (I get it), just use some tracing paper. Just a note: if you’d like to share with your friends, please share this post on Facebook and Pinterest. That way, they’ll be able to get this set of hand lettering prompts, the free calligraphy and brush lettering workbook, and all future sets. Happy Spring to you. Join me over at Ruffles and Rain Boots on Facebook to share what you’re working on. Let’s inspire everyone with the changing of the season! These are great! I want to believe it is really spring. But here in NY, last night a storm dumped over 15 inches of snow. So, I think Mother Nature playing some tricks on us to say the least. That said thanks for the prompts and hopeful that spring will find us sooner rather than later now. I just discovered your site and this series of prompts. How wonderful of you to provide this to your readers. I have seem many lettering prompt lists but none that actually provide tutorials on different styles of writing. I can’t wait to start! 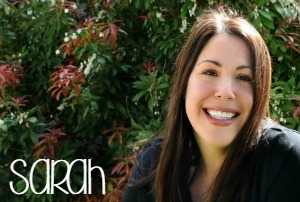 I have downloaded the March and February prompts and have signed up for your newsletter to access the January download. Thank you again for what promises to be a very productive lettering year! I’m so glad we discovered each other, Shelley. Hand lettering takes a lot of practice and I get so bored practicing a single style. I need to jazz things up and even try the same quotes or sayings in different styles to really be happy with a finished piece.